The highly demanded and much awaited feature is finally here! Now you can use the same Binfer account across multiple devices. This allows you to share a single license across all your devices and transfer files between them easily. Read on for details. Contacts view now shows additional information about the contact’s device: name, operating system and remaining disk space. This will help to identify multiple devices easily and know in advance if the device has enough space to receive the files. A new groups view has been added under the contacts tab. Devices can be added to one or more groups. Entire group can be selected as recipient of files. When files are added to the group, all members receive the files. A message with same name as the group is created. New files can be added to the group and will download in the same location for the recipient. This way, all project files will be in the same location. Instead of creating a new message, files can now be dropped over a contact or group for quick file sharing. Files shared this way will always go into the same message and folder. Both files and folders can be dropped. 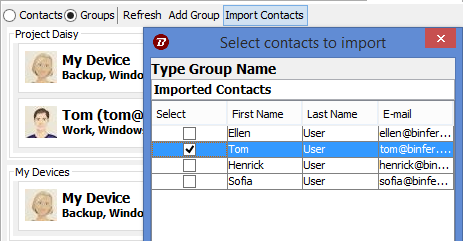 Contacts can be easily imported from Outlook CSV format. Most email providers such as Yahoo or Gmail have capability to output the address book in Outlook CSV. When a file is resent, by dropping over a contact, group or chat Message, Binfer can detect that the file has changed and is able to download new version based on the file version control policy. The file receive policy determines if the exisitng file should be kept, replaced or overwritten. An option has been added to allow removal of all files from the New Message with a single click. All Web App URL’s are now encrypted. File transfer between home computers (aka LAN file transfers). Say, you have a Mac and you spouse has a Windows 8.1. You need to copy files between these two devices easily. With license sharing, you do not need to create two account. Just create one account and login to Binfer from both devices. Purchase a single license associated with that account. Now simply drag and drop file over the other computer(or send them using New Message). Usage is deducted from the shared license. File transfer between work computers. Say, you need to periodically transfer files between multiple computers located all over the world. Using FTP or Cloud based alternatives to achieve this would be a maintenance nightmare. With license sharing, this can be done with a single Binfer account. Simply, login with the same account on all computers. All devices will be visible to each other. They are automatically grouped in to “My Devices” group. Now, when you drag and drop files into the “My Devices” group, all your devices will get those files. The East Coast Black Age of Comics Convention has a simple mission: To promote literacy and creativity using comic books. But it had a problem: How to send, receive and share content from content creators and convention registrants.